McCook Army Airfield was activated on 1 April 1943. It is located nine miles (14 km) northwest of McCook, a city in Red Willow County, Nebraska, United States and is southwest of North Platte, Nebraska. It was constructed in 1943 . The 2,100-acre (8.5 km2) site is bordered on all sides by level farm ground. 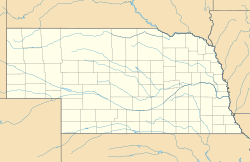 McCook AAF was one of eleven United States Army Air Forces training bases in Nebraska during World War II. The 2,100-acre (8.5 km2) base included three 150 by 7,500-foot (2,300 m) concrete runways, five hangars, and barracks for 5,000 men. It operated with three divisions: Base Services (hospital, chapel, theater, band, gymnasium, fire station, post office, photo lab, library, and military police); Maintenance and Supply (air service groups, post engineers, machine shop, warehouses); and Training (celestial navigation, gunnery and bombing, communications, radar, and aircraft maintenance). Approximately 110 buildings and structures were constructed. The airfield was activated on 1 April 1943, under the command of Second Air Force Headquarters, Colorado Springs, Colorado. The host unit at the airfield was the 520th Operational Training Unit as part of Air Technical Service Command. The 520th was assigned to the 16th Bombardment Operational Training Wing (August 1943 - March 1944), then transferred to the 17th Bombardment Training Wing in March 1944 for B-29 training. McCook provided final training of heavy bomber crews for the B-17 Flying Fortress, Consolidated B-24 Liberator and Boeing B-29 Super Fortress. Some 15,000 servicemen and 500 civilians were stationed at McCook. Bomber crew members received final proficiency training at the field before deployment in North Africa, Europe, and Pacific Theater of Operations. Among the bomb groups trained at McCook were elements of the 8th, 15th, and 20th Air Forces. These bomb groups saw combat in the European, Mediterranean, and Pacific Theaters. With the inactivation of the 448th Bomb Group, McCook AAF was inactivated and placed in reserve status under supervision of the 2347th Air Force Reserve Training Center. The Airfield closed on 31 December 1945, and was acquired by the state of Nebraska from the War Assets Administration in 1947. In 1950, the city of McCook took possession of the airfield for a municipal airport, however, found that its distant location from the city made it inconvenient. The city of McCook turned the McCook airfield back to the State of Nebraska in 1952. Today the land is owned primarily by farmers and the Nebraska Bureau of Land Management. Most of the concrete runways have been removed except for a 20' strip on the E-W and SW-NE runways. About a dozen World War II-era buildings still exist at the former airfield in various states of deterioration including all the hangars.